Today is the start of Suicide Prevention Week 2012. As I am opening up about my depression in the hope that my journey may help me and some one else, I felt a post to raise awareness would be appropriate. The main aim for me writing this post is to try be open and in my own way attempt to help people talk about it, to try drop the stigma. I have been there; I had the thoughts, done some stuff and felt the shame and guilt. There are many sites available and hotlines to call if you are having suicidal thoughts. These organisations are geared up to help and there to listen, should you feel you can't speak to anyone in your life. I never felt I could talk to someone, it fed into the not wanting to be a burden. Life of Cyn wrote a moving piece on suicide awareness and urges you to be selfish, look after yourself. For me it didn't matter if it was confidential or that they were trained, I didn't feel I could tell someone. I mean what do you say? How do you start that conversation? I had the fear that they wouldn't understand and admittedly many people don't. I had the guilt that I was wasting NHS resources. I felt the shame of dragging my family into the mess I created for myself. But my message to anyone who stumbles upon this and may be in that place living it right now, is just talk. Suicide is something we don't talk about, so when people really need to be talking about it, it becomes so much more difficult. If you reach out and talk, and find someone that will listen, one of the many organisations that are there to help, it could save a life. Scotland's initiative is Choose Life, a national strategy to help prevent suicide. There latest campaign is Read between the lines. 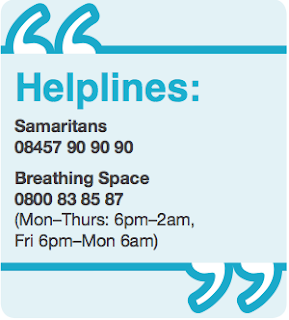 Could you help someone with suicidal thoughts? We all can help to prevent suicide by talking about. A guide to talking, listening and reducing stigma surrounding suicide. I urge everyone to brush up on their listening skills. Yes it's a difficult subject. But it does need to be discussed.